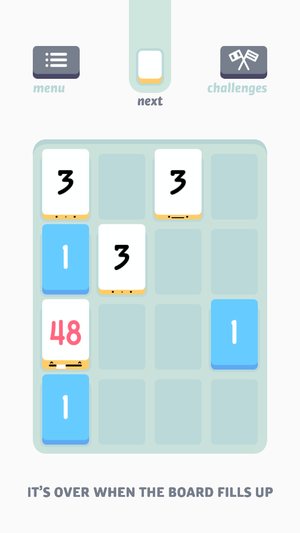 Threes is the kind of game you can pick up almost instantly: It’s cute, has great music, and a simple premise. Combine number pairs! Add one and two to make 3! What could be easier? Contrary to what my gentleman friend believes, getting 64k is not impossible. Well, from the amount of times my gentleman friend has yelled “I hate this game!” in my general vicinity, probably a few things. I suspect that part of the reason he’s been grumping in earshot is that my score is currently 61,000 points higher than his. Whoops. 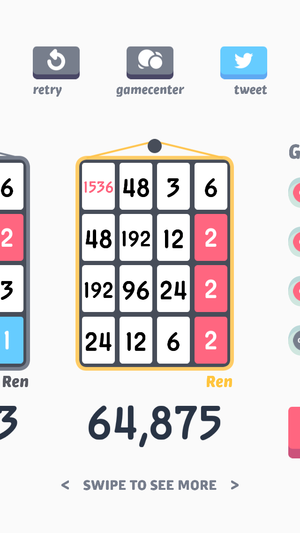 Here’s the thing: Like many strategy games, Threes has both rules and guidelines. The rules are the limits of the game: You can’t combine 48 with 24, and 1s can only add with 2s. Guidelines, however, I compare to Blackjack’s basic strategy—for every move you can make in Threes, there’s an optimal way to do it. 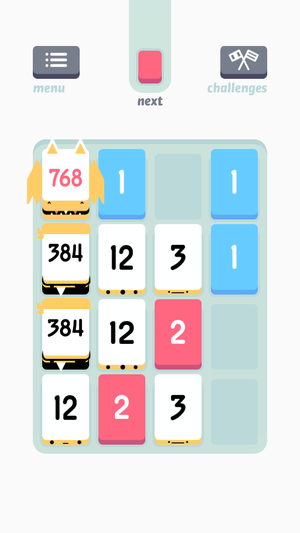 I can’t claim to have the most optimal way to play Threes, as I’m still missing the last two elusive Threes tiles: the 3072 and the 6144. But I think I’m on the right track. And maybe I can put you there, too. 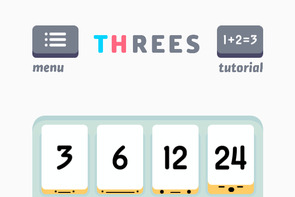 Most Threes players know the game’s basic tips, which are shown to you upon starting the tutorial. But just in case you don’t, here are some things to think about when you’re playing. Having all these 1s on one side of the board is bad. Instead, try swiping left to stagger them. 1s and 2s are trickier than most, as they can only combine with each other. As such, you want to make sure that your board is balanced and you don’t have a glut of all 1s in one corner. You also want to be careful that you don’t get 1s or 2s trapped between 3s or higher. If you do, my best suggestion is to work vertically to combine numbers upward so that you can free them. To avoid having a mix of 1s and 3s, I always pay attention to the “Next” tile preview and attempt to match up whatever’s coming where it belongs. 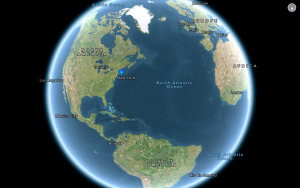 If you swipe from the right to the left, a new tile will appear in the rightmost column in any of the horizontal rows. If you swipe from the bottom, a new tile will appear in any of the columns on the bottom row. The probability of a tile appearing in a certain row or column increases when you are only moving that row (i.e. the other rows/columns are stuck). You can preview what a swipe will do to your board by slowly moving up, down, left, or right with your finger. This is essential for previewing combinations and finding the best move. This sounds common-sense, but I mean it. Here’s an example. Say you have two 6s next to each other, in a packed row surrounded by white tiles, and you have a 2 coming up next. You can either combine the sixes, or move one of the sixes down one row and line up a 2 and a 1 vertically. Even though making the bigger number seems like the smartest idea, you can actually have both if you drop the six and line up the 2 and the 1—because when you combine the 2 and 1, the sixes will line up together again. There are lots of scenarios like this where looking one additional move ahead can help you get a much higher score. The corner strategy is designed to keep your biggest number in the upper left corner. When you start Threes, you’re presented with a mix of blue 1s, red 2s, and white 3s. You can start sliding pretty much anywhere, from any direction, but I have a specific path I like to take: the Corner Strategy. I’m not quite sure who invented the Threes corner strategy, as I’ve seen it mentioned in a bunch of different blogs since the game’s launch, but it’s my go-to starting point. I’ll admit, I pooh-poohed it when I was first starting to play. “But it takes away all my horizontal movement!” I grumbled. That’s true, but after playing for several weeks, and using the corner for most of them, I think vertical movement is much more important to the flow of the game. So, what is the corner strategy? In short, you put your highest number in a corner, and build around that. For me, I’ve had the most luck putting my tile in the top-left corner, and building vertically upwards from the first and second columns. 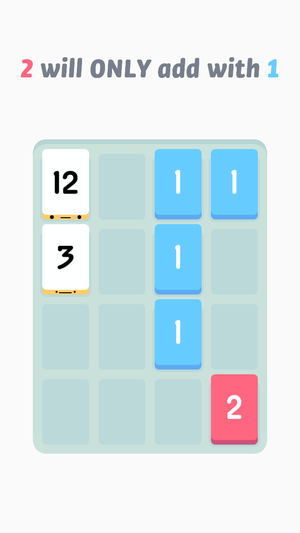 When I first started playing Threes, it was fairly easy to get a 12 or a 24 into that top-left spot, but I think the game’s engine has been slightly rejiggered since then. As such, I don’t worry too much if I can’t get my top number immediately into that corner; I just focus on that being my eventual goal. So how do you put the most successful corner strategy into play? It’s going to be really tricky to get your highest number into the corner if you have a 2 or 1 stuck in that spot surrounded by 3s and 6s. At the beginning of the game, I’m happy to move in all directions and try and combine any 1s and 2s from that side of the board. In time, that 48 will join a friend in the top left corner to become a 96. Say your first 12 or 24 is in the first column, but the second or third row. Don’t worry about it, just focus on keeping a healthy board and combining numbers primarily on that side. I don’t generally worry unless I’ve made a 192 and it’s not at the top of the board. Once you’ve gotten your biggest tile positioned in the corner, now it’s time to think about combining bigger tiles. I like to combine upwards, with my smallest numbers in the bottom left corner (say, a 3), middle numbers in the 2nd and 3rd row (6 and 12), and the biggest number in the top left. WARNING: When you’re combining tiles upward in your leftmost column, pay close attention to the “Next” tile. I’ve gotten 1s and 2s stuck in this column, surrounded by white tiles, because I wasn’t paying attention to what would pop up when I combined two 12s. Once you’ve set up your board, you can keep trucking for awhile with the basic corner, but here are some more advanced suggestions if you get into trouble. Line up your 1s, 2s, 3s, 6s, and 12s horizontally; focus on combining the bigger numbers vertically. Once you get to 384 tiles and above, it becomes a little cumbersome to just combine big numbers in the leftmost column. To combat that, I try to combine my biggest numbers (48+) vertically in columns 1 and 2, and my smaller numbers (3-24) horizontally in columns 3/4 and rows 1-4. When you get to higher and higher numbers, you’ll often have to work in both vertical directions to get enough combinations. That’s totally fine, just make sure you’re lining up your combos properly and not staggering them. For instance, 12 / 24 / 12 / 24 is a bad column; 12 / 24 / 24 / 12 is a better column; and 24 / 24 / 24 / 12 is an ideal column. There's nothing more fun than being able to clear an entire column. One of the reasons I like working on my middle-to-big numbers in the first two vertical columns is that I can build multiple combos that can then be made vertically (for the first column) or horizontally (second column into the first column). The more stacks you can build, the better your board clear will be when you finally have the right numbers on the board to make a double of your biggest tile. When you’re down to one or two spaces and you have combinations to make, delay them as long as possible. (Generally, until a move will break them up.) It’s likely you’ll get more combinations from waiting than making the move despite it being bad for the “Next” tile. When you’re down to one space left, what move will get you the most additional moves? Like the previous tip on delaying your combinations, use the preview slide to figure out what move will get you the most additional moves to your game. I’ve been down to one move before and been able to get out of it by lining up one tile that subsequently allowed me to combine numbers all the way to the first column. When you’re down to your last move, if moving the corner might get you a few more moves, then you move the corner. You may mess up potential multiple combinations, but 10 more moves is better than one. No guide would be complete without a hat tip to other successful strategies, of which there are several. The Wall: TouchArcade’s forum has kind of gone a little stir-crazy trying to beat Threes, like cracking its card draw algorithm. One TouchArcade member grabbed the 6144 card by using the walls and praying that the random “+” white cards would work in her favor to instantly combine high-numbered cards rather than relying on traditional stacking or cornering. The Center: Don’t like the walls or the corners? You might prefer the center float strategy, which I’ve seen mentioned over the past few weeks in my Twitter feed. I used to try and keep my biggest tile in the center, but found it didn’t work so well for me past 384; others may have better luck, however. Threes is a simple but enthralling time-sink of a puzzler, filled with charming touches and a beautiful interface for both iPhone and iPad.